The photograph here was taken in a flat in Carden Avenue in 1947. As you can see, our modern kitchens are light years ahead of this housewife’s very spartan environment. She has a gas cooker, but if you look closely on shelf above the cooker, you will see she has an electric iron. At this time some housewives were still using the old flat iron which you heated either by the fire or on the gas burner. Of course no kitchen of the time was complete without the ubiquitous copper boiler. As a preschool child I remember my Grandma’s copper boiler. If I think back I can almost smell the aroma of hot wet clothes. My favourite part of washing day was helping Grandma put the clothes through the mangle which stood in the back yard. 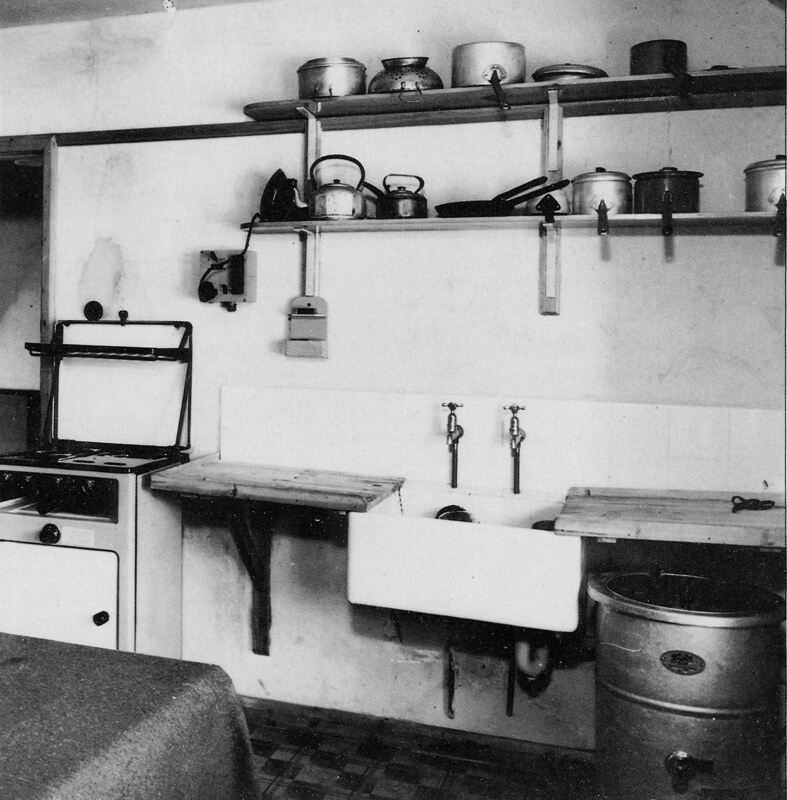 Do you remember a kitchen like this? Do you remember the familiar washing day routines? Please share your memories by posting a comment below. Carden Avenue is a long road! and the housing developed from the 1920s along the southern-Patcham- end with some upmarket individual housing. In the 1930s there were small builder developments of similar property, with a Braybon estate [Carden Avenue Estate at the northern end started in 1935; but the big changes come at the date above 1947 when the area north of the Long Man of Wilmington pub was developed as local authority housing to rehouse Brighton residents affected by slum clearance and wartime damage to housing. This are was to be a private estate prewar Withdean Estate East by Braybons but the council took over the land for the massive housing scheme and factory devt in Crowhurst Rd. This image looks to be from that devt. We moved into Hartfield Avenue in 1992 and we still had those draining boards in the kitchen. I grew up in a Hollingbury council house built around 1950. I remember those sinks with the wooden draining boards! My mum used to scrub hers clean with Ajax powder and a scrubbing brush. And she would pretty it up with a gingham curtain. No washing machines, fridges, etc. But we had a larder which kept fresh produce cool, although it had to be bought daily. Mum would keep bottles of milk cold by standing them in a bucket of water on the larder floor. Hello Geoff. I just assumed these must be the local authority flats opposite what is now Uncle Sams in Carden Avenue. I can’t think where else they could be. We lived in a house on the other side of Brighton and I can remember our kitchen was almost a complete replica of the one in the picture. I can remember having a larder in the kitchen and yes, we kept milk fresh by standing it in a bucket of cold water. I lived in Hartington Terrace, The houses were built in 1910 and all had basic services: cold water, outside toilet and a brick built copper in the kitchen, which had to be fired up for Monday wash days and Friday bath nights in a tin bath.The pantry was in the corner of the living room as there was no storage space in scullery/kitchen. I was born in early 1944 as a young child I remember most of the above were still being used. I was born in 1953, but recall my parent’s stove looking far older than the one shown here! They didn’t have a boiler but eventually bought a twin tub, the sink was somewhat shallower than a butler (until dad replaced it with a stainless steel jobby circa 1964). We had an electric iron, I believe it was a wedding present, but mum kept the flatiron in a cupboard “just in case”. And yes, Sunday night was bath-night and we shared, in turn, an old tin bath in front of the fire. There was no inside toilet until the late fifties, but I’m far too young to recall that!